White with faint bluish-green tinge. ~1750 - Stolen by a French deserter, a grenadier from the Carnatic wars and sold on in Madras. ~1770 - Purchased by Count Grigory Grigoryevich Orlov and presented to Catherine the great of Russia. 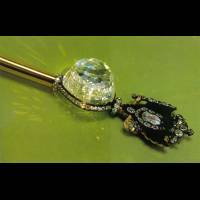 1784 - Incorporated into the Imperial Sceptre of Russia.